As The Time Bum reported here, and here, Manchester Watch Works has a new project in the works. I have already previewed the TatoskoQ, but now that it has launched on Kickstarter, I got my mitts on a pre-production sample. Call it a post-preview maybe? Protoype review? Whatever. I got it, I wore it, and after a few days on the wrist, I found I rather liked this oddly named watch with its clever spin on the familiar diver's design. 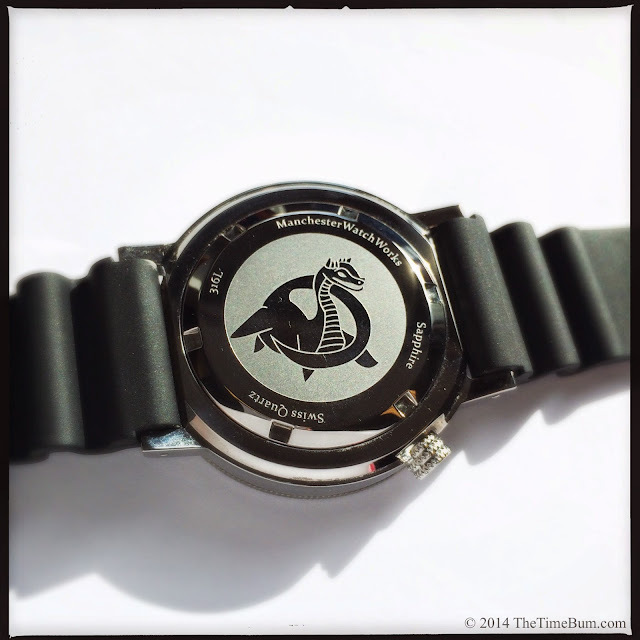 It is 42.5mm wide, 47mm long, and just under 12.5mm thick, which is on par for a diver. The Kickstarterpage lists it as 11mm thick, but that is the case only. The case back adds a bit more. It is a standard sized watch for people who want a larger look. The stainless steel case is shaped like a hockey puck: broad, round, and flat-sided with straight lugs. It does not occupy much space on your wrist, but its proportions suggest mass. This impression is heightened by the flat bezel and crystal, and a vertical rehaut that accentuates the depth of the dial. 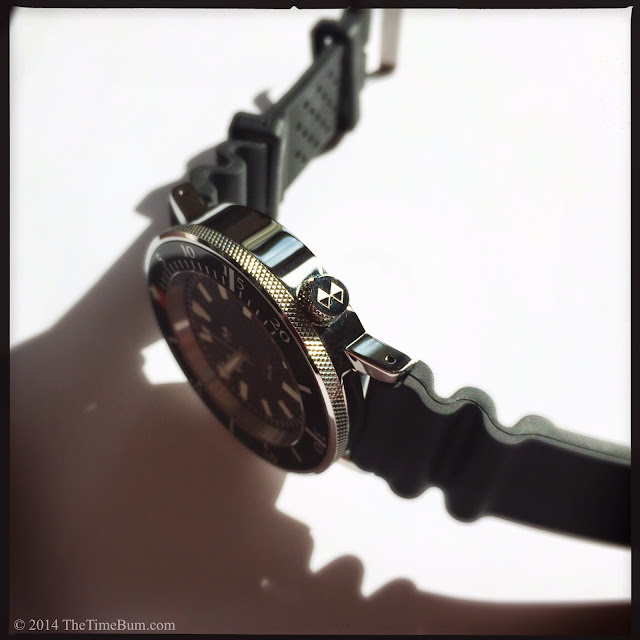 The case is offered in three finishes: polished, matte blasted, and black PVD. My sample was polished, a clean and attractive look that suggested some dress-diver aspirations. 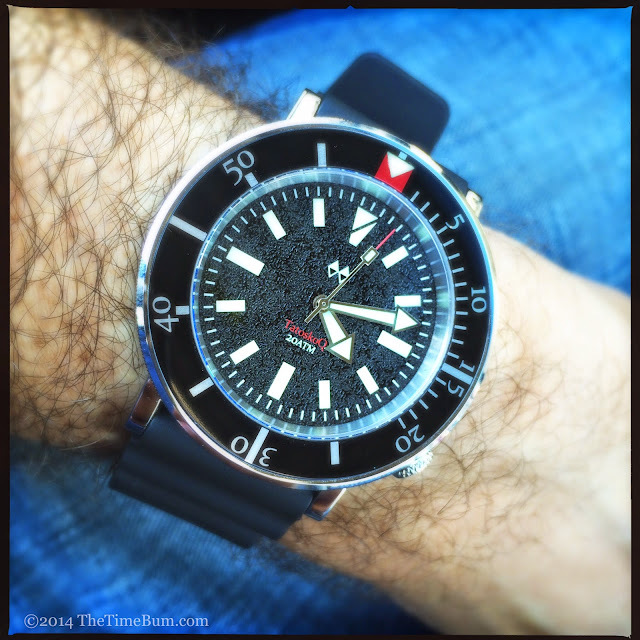 Speaking of different, the TatoskoQ's dial certainly stands apart. When the watch was first announced, it promised a sand textured dial. I pictured a rough surface, and that assumption was correct, but I did not anticipate the way it would catch the light. The tiny peaks actually sparkle in sunlight. You may have to squint a bit to read the red model name and white water rating, but the large rectangular markers and white index are plain as day, as are the broad arrow shaped hands. 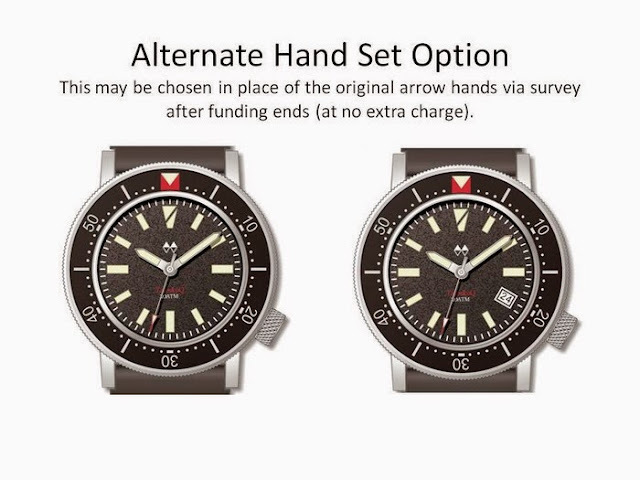 [Update: MWW has added an new option for different hands too. See pic below.] The trapezoidal 12 o'clock marker is split crosswise, not unlike a diver down flag, an association underscored by its position beneath the red bezel marker. 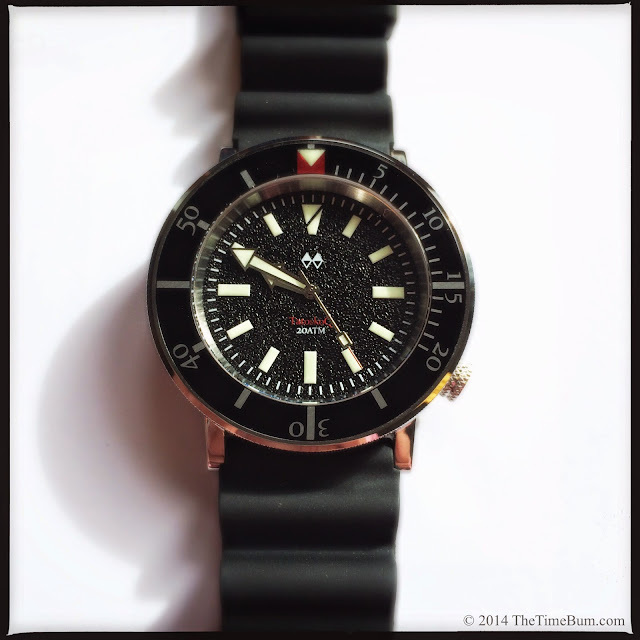 It is a handsome dial and these unexpected twists set the TatoskoQ apart from its competition. The TatoskoQ is more than just flash. It also has all the right specs for undersea adventure. A 6mm knurled and signed screw down crown sits at 4 o'clock. A notch in the underside of the case affords easy operation. The sapphire crystal has an anti-reflective coating. The watch is rated for 200m water resistance and has C3 SuperLuminova on the hands, markers, and pip to ensure visibility as the daylight fades. 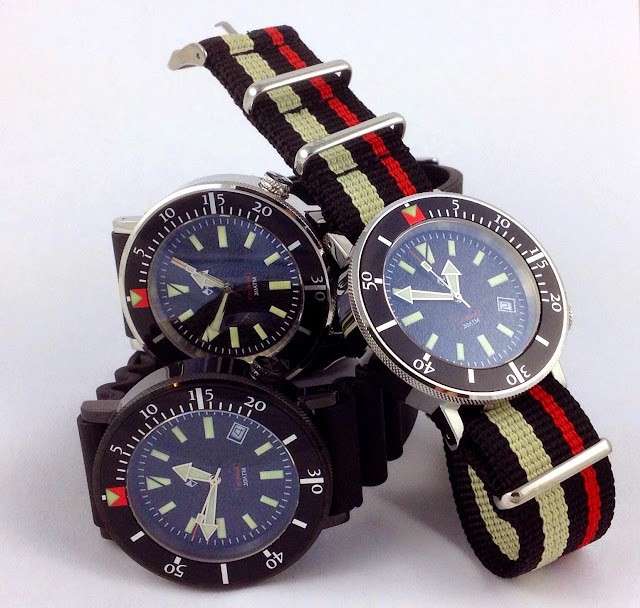 It is supplied with a 22mm perforated polyurethane strap and the option of a MWW designed tricolor NATO. The sample had the poly, and frankly, it was not my favorite. I found it unpleasantly stiff and overly long. Given my druthers, I would opt for the more comfortable and attractive NATO. 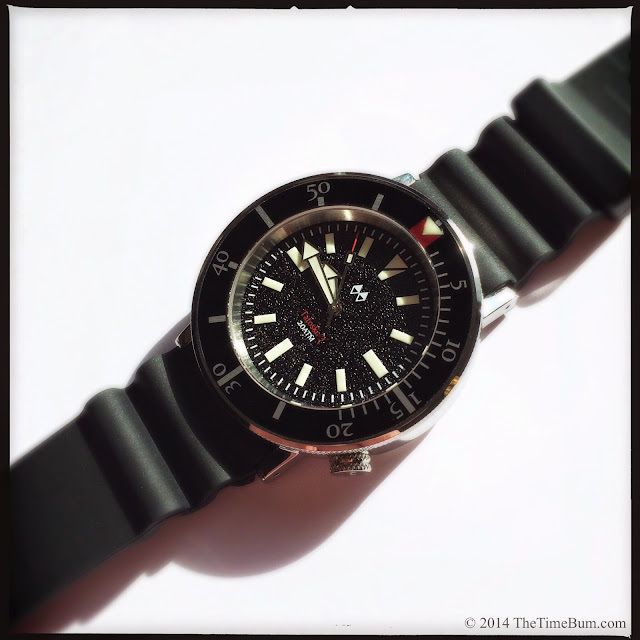 While nylon straps are an excellent practical choice for water, many dive watches are just too tall and bulky for them; however, the TatoskoQ's relatively low profile has no such problem. It would also look rather sharp on black leather or sailcloth with red stitching. Drilled lugs make strap swaps a breeze. The watch is named for a mythical creature of Native American Abenaki mythology that was said to inhabit Lake Champlain, Vermont. A friendly cartoon drawing of the beast graces the case back. Inside, you will find a Swiss made Ronda 715Li quartz, a long life movement with 5 jewels, gold plating, and a battery end of life indicator. The "Li" denotes the lithium battery, which should last 10 years. The watch may ordered with or without a date window. My sample came without, and while I generally prefer it this way, I am less adverse to dates on quartz movements as they are more amenable to set and forget. The TatoskoQ's date will be black-on-white, replacing the 4 o'clock marker for a relatively seamless integration into the dial. The TatoskoQ will retail for $358 and early backers can get theirs for as little as $198. The three finishes, two strap, and date options allow you to tailor the watch to your needs. I liked the polished sample, but if you seek a more rugged appearence, you might try the blasted finish. For me, the black PVD is right on the money, combining the utilitarian stealth look with an almost piano lacquer gloss. 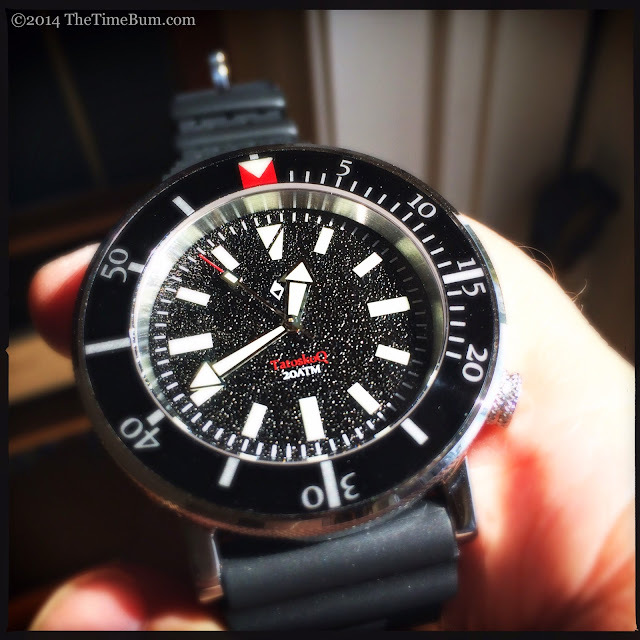 If you are in the market for a diver, you should a have a look at MWW. 12/6/14 Update: The TatoskoQ failed to fund, but MWW is moving forward with production and has replaced the quartz with a Miyota 9015 automatic! You can pre-order one for $230 on Watchuseek. Sum: Nicely done diver. The Time Bum approves.